An innovative thinker, spiritual enthusiast, and person of integrity, Carolyn Rafaelian is undeniably making her mark. As the founder, Creative Director and CEO of ALEX AND ANI, Rafaelian has harnessed her strong business sense and divine artistic vision to grow a company that she refers to as a way of life. Named Ernst & Young’s New England Entrepreneur of the Year and SBA RI Small Business Person of the Year in 2012, Rafaelian is a force of positive energy building a company with a conscience. A guiding light and perpetual inspiration, Rafaelian is living proof that anything is possible with hard work and a little positive energy.Carolyn Rafaelian was raised in Rhode Island, the jewellery capital of America. With a long line of jewellers in her family, Carolyn knew her future was in jewellery business and became her father’s apprentice at a young age. She launched Alex and Ani in 2004, naming the company after her two youngest daughters. Her patented line of expandable bracelets became a signature look and almost overnight, everyone was taking notice of this fabulous new line. Celebrities, editors and top department stores loved the original concept and captivating designs. 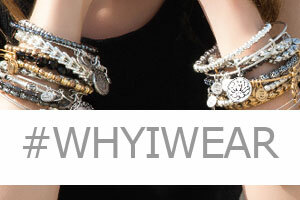 The eco-friendly bangles are made from recycled materials, literally turning trash in to treasure. Made entirely in the United States, Alex and Ani buy metals from local mills and turn them in to beautiful bangles enriched with positive energy. How did Alex and Ani start? It was an easy development for me, I have been surrounded by creativity and jewellery and so Alex and Ani developed quite organically. My father started the project in 1966, it has become the Alex and Ani brand, which was a natural progression. I just want the legacy to continue! How did the Alex and Ani expandable bracelet develop? It came from hoop earrings! It just made sense to me. I wanted a bracelet that you could put on and adjust with one hand, something that would fit everyone. The simple adjustable design is what Alex and Ani is known for now, I love that it enables everybody to create a personal collection of bracelets. What is fabulous about jewellery? Each piece expresses the personality of the wearer. With powerful symbols, inspirational phrases and a big healthy dose of spirituality, Alex and Ani gives everyone the opportunity to express themselves through jewellery. What is your mission statement and how does this effect your business? Alex and Ani is all about positive energy, we are committed to creating unique products of quality and beauty that promote a social and environmental conscience. All of our products are made by hand from recycled materials and are ‘made in American with love’. The re-using and recycling of materials is essential. It’s a feel good brand, and we want everyone to feel good wearing their stack. What inspires your different collections? As with all designers inspiration is everywhere. I am particularly inspired by the people I work with. I make sure I always work with like-minded people where intuition, wisdom, faith and positivity are fundamental. The amount of wisdom I receive through my beliefs and my collaborators is fundamental to the design process. Alex and Ani is named after your children, will they join the company? I want to offer something in what I make. I want to share my knowledge with other people. My daughters share this belief, you need to have a positive affect on the planet in one way or another. It will be so exciting to see them experiment in their journeys through life, I hope we’ll work together in the future!